You can browse the "Products" menu link (top left) to view the full range of product categories offered by us. You can browse our products stock availability status by mouse roll over specific product price tag to view the stock status. This product is in stock and ready for shipping. This product is temporary out of stock. This product is pre-order item. When you are viewing the product, check the product details such as photo, price, packaging etc. 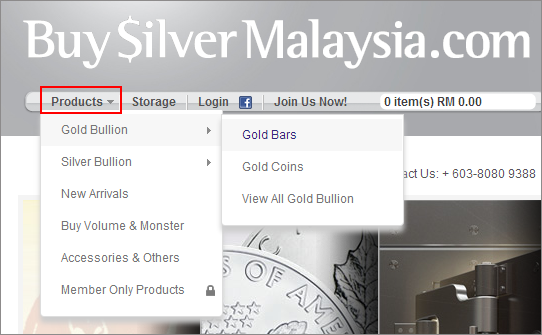 If you would like to purchase a silver bullion product, make sure that you select the appropriate holder for your precious metal. Please refer to our holder chart. It’s easy, just enter the quantity and click "Add to Cart", the item will be added to your cart. After adding the item to your cart, you can click "Checkout" if you are ready to proceed with the payment, or click "Continue Shopping" if you want to add more items to your cart. Once you have done shopping, you can review your shopping cart and ready to go! You can change the quantity of each product and click "Update". You can also remove product that you don't want to purchase. If you aren't login as a member, you can either checkout as a member or a guest. It's not compulsory to register as a member to make purchase but members are able to accumulate and use store credits to make payment. If you are already login, just click "Checkout" to proceed. Please enter and check your email, name, address and phone no. Shipping cost will be calculated based on your shipping address (it’s free if your total order amount is RM1,500 and above). Do take note of the estimated delivery time. If you are login as a member, you can apply store credits if you have balance available. If you have any coupon, you can apply it too to enjoy the discount or promotions. Carefully review the order summary on your left and select your preferred payment method on your right. Follow respective instructions to make payment if you choose to pay with iPay88. Congratulations! You are done and just sit back, relax and wait for your order to arrive. If you have chosen to pay via bank transfer, you need to make payment first (within 30 minutes) for Gold and Silver products before we process your order. Refer our bank transfer payment instructions. It will be easier if you are a registered member, just login and go to your profile page, click "My orders" and you should be able to see all your order history. Otherwise, you can go to the order status page and enter your order no and email. Make sure to enter this information as it was entered when the order was placed. Partial Payment - Your partial payment is received, order is pending for full payment. Confirmed - Payment has been received, we will process and ship your order soon! Pre-order - Your order in pre-order status and is awaiting for shipment arrive. Shipped - Your order has been shipped! Self Collect - Your order is schedule to pick up. Pending Delivery - Your order is pending for delivery. Transferred to BSP - Your order is being transferred to BSP Program. Completed - Your order has been successfully delivered. Refunded - Your order has been refunded. You can track your order at the respective carrier if your order status is shipped but you still haven't received your order. Your order will be delivered by our appointed courier and we hope you will like our product. If for some reasons you are not, you can request for exchange within 14 days, don't worry! Difficulty in placing order through online? After locking the price and payment method, a non-refundable desposit of 20% or RM 10,000 (whichever higher amount) is required. Validity of the price stands (30 minutes) for Gold and Silver products from the time of phone call. A confirmation email will be sent to you once the payment is verified. For more details of our bank details, click here. If cheque Payment, price follows the date of bank clearance. Please arrange the balance payment within the next working days. Estimated arrival of item is within 5 working days for ready stock items and 2 – 3 weeks for pre-order items. Please arrange self-collection at our office in IOI Boulevard, Puchong, Selangor within 14 days once received self-collection notification via SMS/Email.